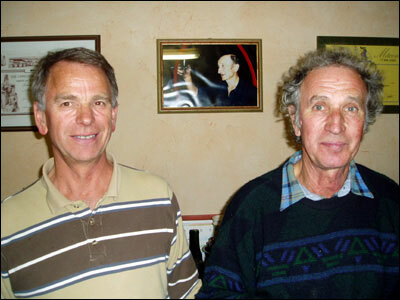 The Trosset brothers, Louis and Joseph, are in their late fifties and took over for their father Charles following his death in 2000. With at least four generations of winegrowers before them, the brothers have some wonderfully-positioned vineyard plots on the steep slopes above the domaine. The siblings have clearly divided roles at the domaine. Joseph works the vines. When asked about the winemaking, he said he would have to speak to his brother. His job, he stated, was to make sure the best grapes make it down the hill and into the tanks. At the end of the day, he receives some guests and makes some sales. His brother Louis, in addition to work at the university, handles the winemaking and occupies himself with sales. 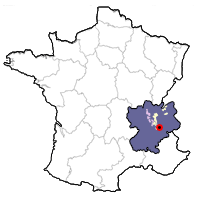 The domaine is located in Arbin, a couple of towns along the curve of the mountain slope from Chignin. 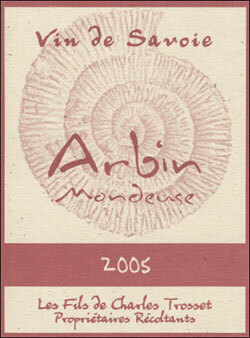 Arbin is one of the 17 crus that exist in the Savoie, although all the wines go under the appellation Vin de Savoie. Tasting Notes: Deep ruby color. Blackberry with a bit of red fruit peaking through, along with a touch of pepper. A hint of herbs (mountain herbs, as in Chartreuse) come through on the rich, full-bodied palate. The lightly tannic finish is also long. Mondeuse is the only grape the Trossets have planted. The grapes are grown on severe slopes (with 35-40% grades) which make it imperative that all work is done by hand. 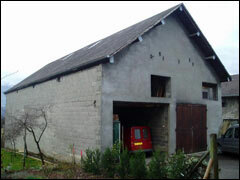 Their four hectares (10 acres) of vineyards are spread over ten parcels, all of which face south. 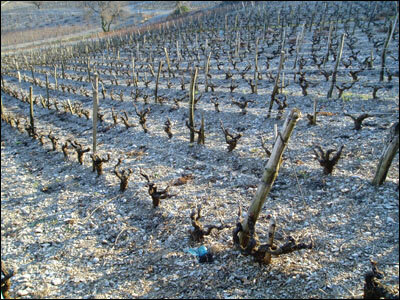 The vines are pruned with the gobelet method (often seen in the Southern Rhône or Beaujolais), and the average age of the vines are 25 years. The older vines are planted with about 45 inches between them. The younger vines have about 60 inches between them, which gives a larger leaf canopy and more aeration. There are no chemical fertilizers used in the vineyard (only organic compost), and the soil is worked two or three times a year which forces the vines to search the subsoil for their essential nutrients. In certain years, a green harvest is performed to further concentrate the grapes. The harvest is entirely by hand, in small plastic bins to avoid any oxidation before the grapes arrive at the winery (right) at the bottom of the hill. Usually the plots are harvested separately, and each goes into a particular tank. Fermentation normally lasts eight to ten days, with a daily pump over. The wine is raised in stainless steel and enamel lined tanks-no wood is used on the wines. A number of different cuvees are assembled, and released under the names Tradition, Prestige des Arpents, Confidentiel, Harmonie and Privilege.